What are the six qualities of a surrendered devotee ? Q: How many kinds of devotees are there ? CC Madhya 22.99: “There are two kinds of devotees — those who are fully satiated and free from all material desires and those who are fully surrendered to the lotus feet of the Lord. 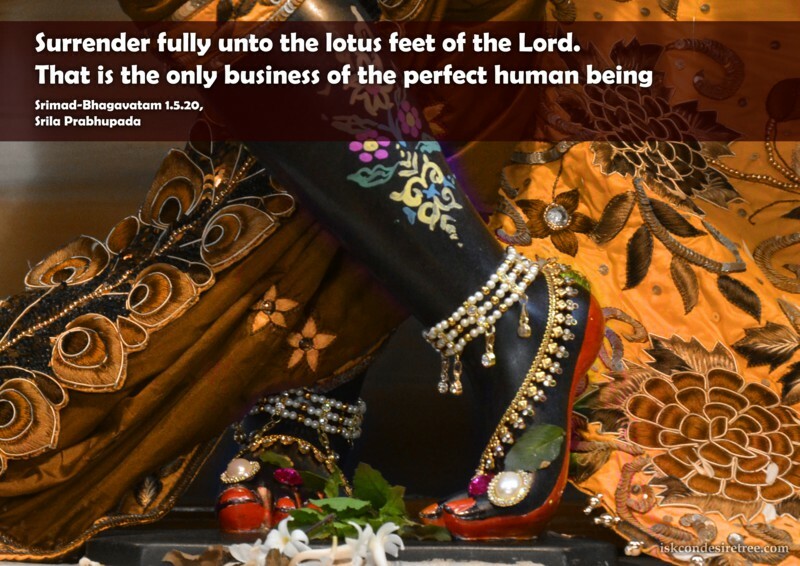 Their qualities are one and the same, but those who are fully surrendered to Kṛṣṇa’s lotus feet are qualified with another transcendental quality — ātma-samarpaṇa, full surrender without reservation. Q: What are the six qualities of a devotee who is fully surrendered to the Lord ? CC Madhya 22.100: “‘The six divisions of surrender are the acceptance of those things favorable to devotional service, the rejection of unfavorable things, the conviction that Kṛṣṇa will give protection, the acceptance of the Lord as one’s guardian or master, full self-surrender, and humility. Srila Prabhupada beautifully expands these qualities in his purport with a very intelligent definition of renunciation in point no. 2. 1) The devotee has to accept everything that is favorable for the rendering of transcendental loving service to the Lord. (2) He must reject everything unfavorable to the Lord’s service. This is also called renunciation. (3) A devotee must be firmly convinced that Kṛṣṇa will give him protection. No one else can actually give one protection, and being firmly convinced of this is called faith. This kind of faith is different from the faith of an impersonalist who wants to merge into the Brahman effulgence in order to benefit by cessation of repeated birth and death. A devotee wants to remain always in the Lord’s service. In this way, Kṛṣṇa is merciful to His devotee and gives him all protection from the dangers found on the path of devotional service. (4) The devotee should accept Kṛṣṇa as his supreme maintainer and master. He should not think that he is being protected by a demigod. He should depend only on Kṛṣṇa, considering Him the only protector. The devotee must be firmly convinced that within the three worlds he has no protector or maintainer other than Kṛṣṇa. (5) Self-surrender means remembering that one’s activities and desires are not independent. The devotee is completely dependent on Kṛṣṇa, and he acts and thinks as Kṛṣṇa desires. (6) The devotee is meek and humble. Q: What is the result of surrendering fully to Krishna ? A: Mahāprabhu gives his benediction and then quotes a verse from Udhava Gita. CC Madhya 22.102: “When a devotee thus fully surrenders unto Kṛṣṇa’s lotus feet, Kṛṣṇa accepts him as one of His confidential associates. All glories to Sri Caitanya Caritāmṛta. All glories to Sri Caitanya Mahāprabhu. This entry was posted in Q&A and tagged atma samarpana, confidential associate of Krishna, full surrender to Krishna, qulaities of a surrendered devotee, Srila Prabhupada on renunciation, what is renunciation, What is surrender to Krishna means. Bookmark the permalink.